Holme Pierrepont Hall is the family home of the Brackenbury family, who are direct descendents of the Pierrepont Family who have lived on this site since 1280. The Tudor manor house on the estate today dates back to 1500, with later additions and alterations having been made to the hall since then. Holme Pierrepont Hall is one of the most historically significant and beautifully individual country houses in the East Midlands, with some of the earliest brickwork in the county. In the past, several notable ancestors have been connected with Holme Pierrepont Hall, including Georgina Brackenbury (1865 - 1949) the renowned artist and militant suffragette and the last Countess Manvers, Marie Louise Pierrepont a prolific and accomplished artist. Three generations of the Brackenbury family continue to live in the Hall today. Self Portrait of Georgina Brackenbury - acclaimed artist, militant suffragette and friend of Mrs Emmeline Pankhurst. Marie Brackenbury - sister of Georgina was also a militant suffragette. The house was built by Sir William Pierrepont around 1500, and has the earliest brickwork in the county. The family played an important part both in the region and on the national stage. 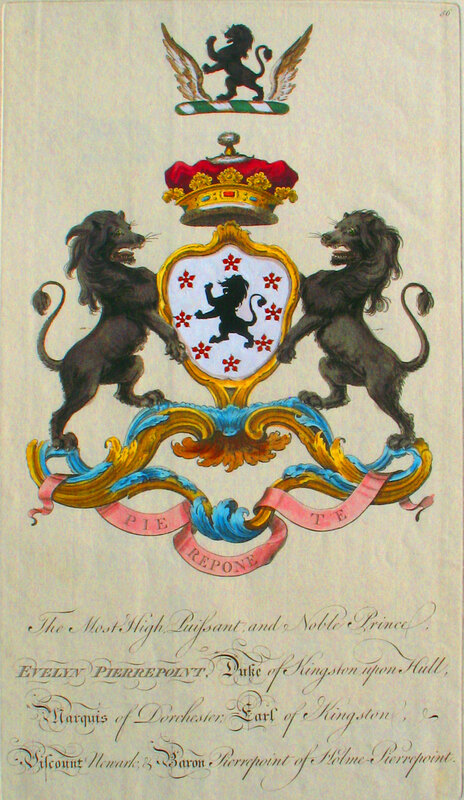 The house has been lived in by the Pierrepont family and their descendents ever since, and there have been a number of distinguished members of the family including: Lady Mary Wortley Montagu, nee Pierrepont ~ Henry Pierrepont, Marquis of Dorchester. There was also the notorious Duchess of Kingston. If you would like to access to the Pierrepont Papers and the archive of both Holme Pierrepont and Thoresby you will need to contact the Manuscripts Department at the University of Nottingham. 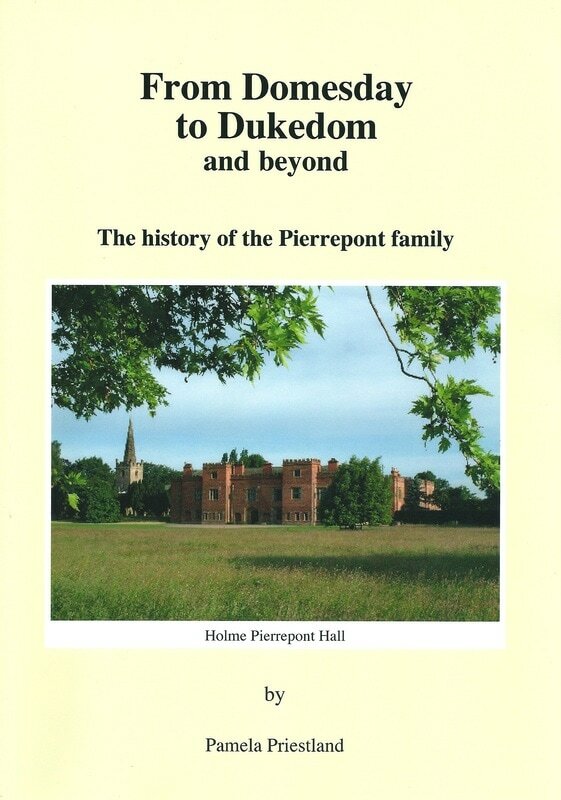 The Pierreponts were based in north and central Nottinghamshire until the marriage of Henry de Pierrepont to Annora de Manvers at the end of the 13th century brought the estate at Holme, four miles from Nottingham, into the family. 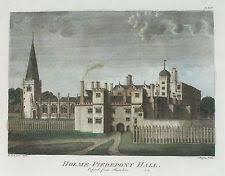 It was not until 1633 that the Thoresby estate was purchased by Sir Robert Pierrepont. The medieval Pierreponts were prominent local landowners and politicians, and two of them, Sir Robert de Pierrepont in the fourteenth century, and Sir Henry Pierrepont in the fifteenth century, also distinguished themselves on the battlefield. Sir George Pierrepont (d 1564), Sir Henry Pierrepont (d 1616), and Sir Robert Pierrepont (d 1643, created Earl of Kingston-upon-in-Hull in 1628) presided over a period of expansion and consolidation of the family estates. Following Robert's death in 1643, his eldest son Henry, created Marquess of Dorchester in 1645, succeeded to the Holme Pierrepont and Orton Longueville estates. However, most of the Earl's purchased estates were settled on his second son William Pierrepont (d 1679) of Tong Castle, Shropshire, and later of Thoresby. The Marquess of Dorchester died without male issue in 1680, when he was succeeded as 3rd Earl of Kingston by his great-nephew Robert Pierrepont of Thoresby. The 3rd Earl died in 1682, being succeeded in turn by his brother William as 4th Earl and in 1690 by another brother, Evelyn (c.1665-1726), as 5th Earl. The 5th Earl of Kingston was created Duke of Kingston-upon-Hull in 1715, and was succeeded in 1726 by his grandson Evelyn (1711-73). The male line died out with the 2nd Duke of Kingston in 1773. The estates were inherited in 1788, following the death of the Duke's widow, by his nephew Charles Medows (1737-1816), despite the legal challenges of Charles's elder brother Evelyn, who initiated a successful court case against the Countess of Kingston for bigamy. Charles assumed the surname Pierrepont in 1788, and was created Viscount Newark in 1796 and Earl Manvers in 1806. He was succeeded by Charles Herbert, the 2nd Earl (1778-1860), Sydney William Herbert, the 3rd Earl (1825-1900), Charles William Sydney, the 4th Earl (1854-1926), and Evelyn Robert, the 5th Earl (1888-1940). The first four generations of Earls Manvers were all based very firmly in Nottinghamshire, taking local offices appropriate to their status, and interesting themselves greatly in local affairs. The 5th Earl was incapacitated, and the estates were administered through a trust. In 1940, his cousin Gervas Evelyn Pierrepont (1881-1955) succeeded as 6th Earl Manvers. With the 6th Earl's death the Manvers title became extinct, although an estate still survives, based at Thoresby Park. In 1287 when Henry Pierrepont married Annora de Manvers she was the sixth generation of her family to live here which possibly takes us back to around 1100 and there has been a continuity of ownership with links back to that time ever since. The Pierrepont name died out at the end of the 18th Century and with ownership going through the female line the surnames changed. Over five centuries the house has evolved in to what it is today. Nestling on the edge of West Bridgford in open countryside yet only five minutes from the cricket ground at Trent Bridge. The house was at the centre of a huge estate that stretched from the A46 to Sneinton in Nottingham. The hamlet of Holme Pierrepont has a very rural feel dating back to the days of a large agricultural estate. The estate was sold in 1941 due to death duties and possibly the family mismanaging their money in the Victorian era! The house was withdrawn from sale along with its thirty acres of Parkland and Gardens as at that time no one wanted the burden of taking on such a building. It was then lived in by Sybill Argles, daughter of the 4th Earl Manvers who died with no heirs in 1967. Two years later Robin and Elizabeth Brackenbury bought the Hall to save it from leaving the family, the only time in its history that the house has been sold. Elizabeth Brackenbury is the Great Granddaughter of the 3rd Earl Manvers and her descendants continue to live here. Today as well as being a family home the house is used as a venue for events and the house and garden are also open to the public for part of the year. ​This Grade I listed building, its contents and surroundings are enjoyed by thousands each year. More can be discovered in the different areas of this website. Find out more about the history of Holme Pierrepont Hall and the Pierrepont and Brackenbury family history in this Catena Youtube podcast. ​Video courtesy of Claire Bicknall and the Catena Network. Find out about the history of Holme Pierrepont Hall in later years in this personal history account captured in 2018. An interview with Robin Brackenbury and the late Elizabeth Brackenbury.